I will review My Envy Box November 2014 Edition today, I got my box 2-3 days ago, but something or the other kept me busy.This month’s box was a detox box basically that has been curated by My Envy Box team. This time the box has a very Autumn appropriate magenta color that holds loads of samples including a treat from San-Cha-tea. 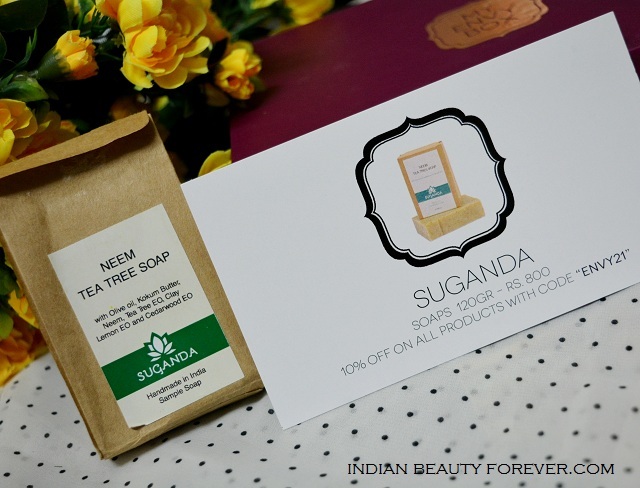 Sugandha soaps are handmade soaps. They offer a new range of quality handmade soaps. The neem and tea tree soap is ideal to be used by oily to combination skin as Neem and tea tree heals and controls acne. I would like to try it soon. Thalgo exfoliator is designed to exfoliates gently and ideal for dry sensitive skin. It hydrates, revitalizes and tones the skin. This gentle cream reveals luminous skin and offers a refreshing sensation. Za products are not new on my blog. After trying their full sized products and reviewed most all of their products now, I can say that their products are worth trying. I am currently using Za Perfect Solution cleanser and moisturiser. You may have seen the review yesterday. I am highly impressed with this brand from the house of Shiseido therefore, I think it’s good that their samples are included in My Envy Box so that more and more people get to try out Za's range of products. 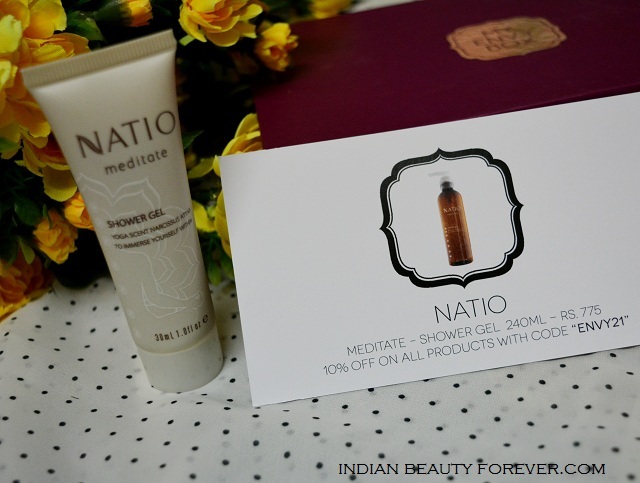 Natio is an Australian brand and I already have 2-3 of their samples with me. This shower gel smells divine and I would love to try this in full size. Once, I am done with my The Body Shop Shower gels. It smells like incense infused some woody notes. 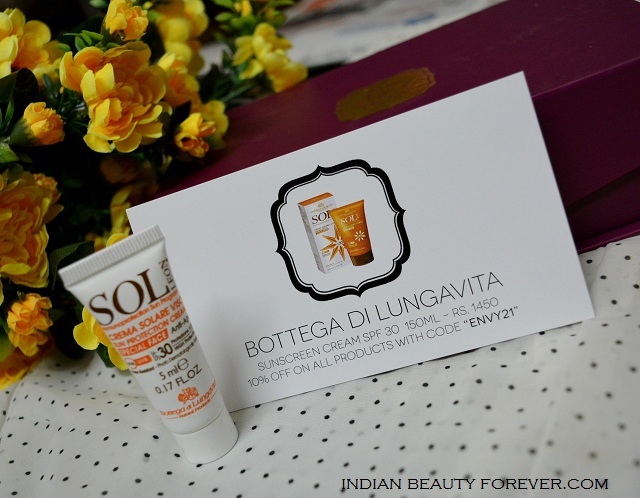 Bottega Di Lungavita Is an Italian brand and if you follow my blog regularly, I have already done reviews of their products like eye cream, eye serum and the miceller water makeup remover that I am still using. Their product are good. I used this sunscreen. It wasn’t too greasy theerfore I may use this. 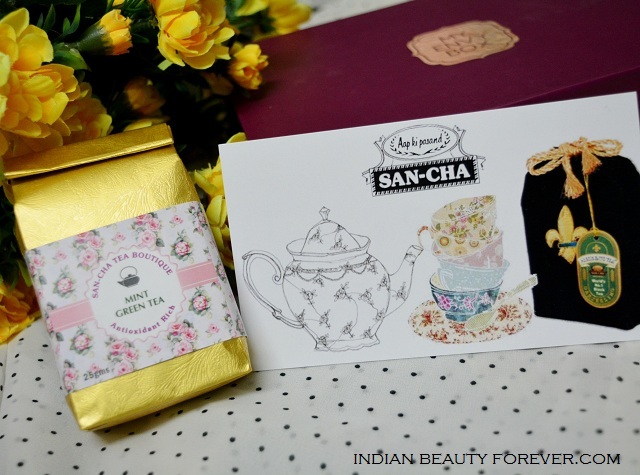 It was not a part of the regular 5 samples that are included in the box but it was a mini detox treat by San-Cha-Tea. Green tea is high in antioxidants that flushe out the free radicals from the body. I liked the cute packet and the way the tea was packed. Really cute! San-Cha-Tea Boutique are located in Chanakyapuri, Santushti shopping Arcade and opposite DLF Galleria market, Gurgaon, in case you’re interested. 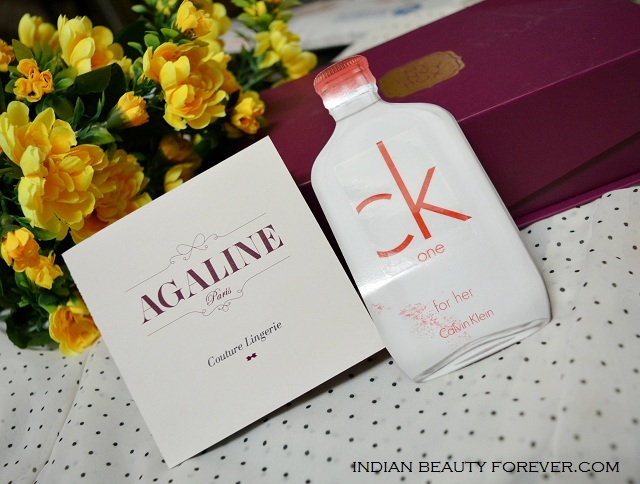 Then I have this one time use Calvin Klein One fragrance for her. And this tiny AGALINE Paris info card, You can check out their couture lingerie and like them on facebook to get a free gift. I liked this month’s box as a subscriber since it exposes to try out various new international brands out there. I will recommend you to go and subscribe for this box and get a dose of happiness for yourself. You’ll like it. I am gonna go and have a cup of green tea now!